Be the second owner to love this special home in Serenity Cove! The original ones have beautifully customized, thoughtfully upgraded and impeccably maintained it. Interior features include an open floor plan, entertainer's kitchen, shutters, ceiling fans and tile throughout, custom cabinetry in the living room and office furniture in one bedroom, a renovated master bath and a finished garage with ample storage. Exterior features include a north facing back yard with west mountain views. The centerpiece is a spectacular TILED salt-water pool and spa flanked by a covered patio with built-in barbecue, fire pit, ceiling fans and custom lighting. 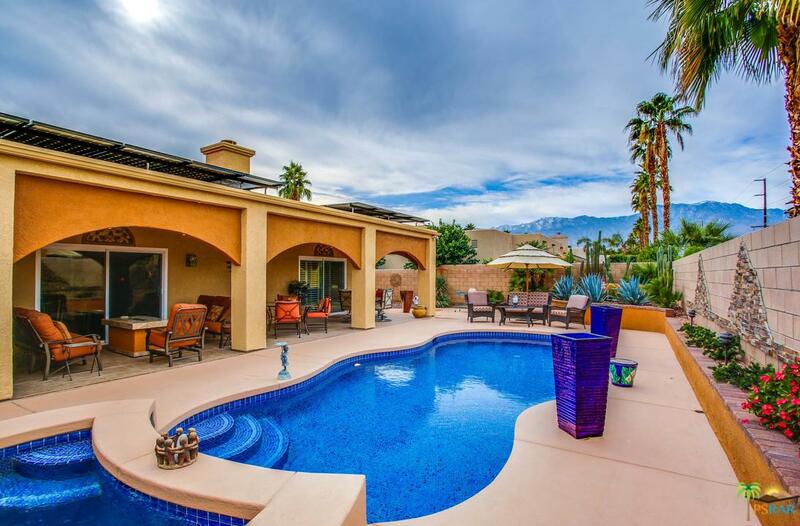 Professionally designed desert landscaping extends to the front and side yards as well. A transferable solar electric lease, dual-pane windows, newer Trane furnaces and a/c units, a solar-powered attic exhaust fan, a variable speed pool pump and an electric vehicle garage outlet keep current average monthly electric costs at less than $200.